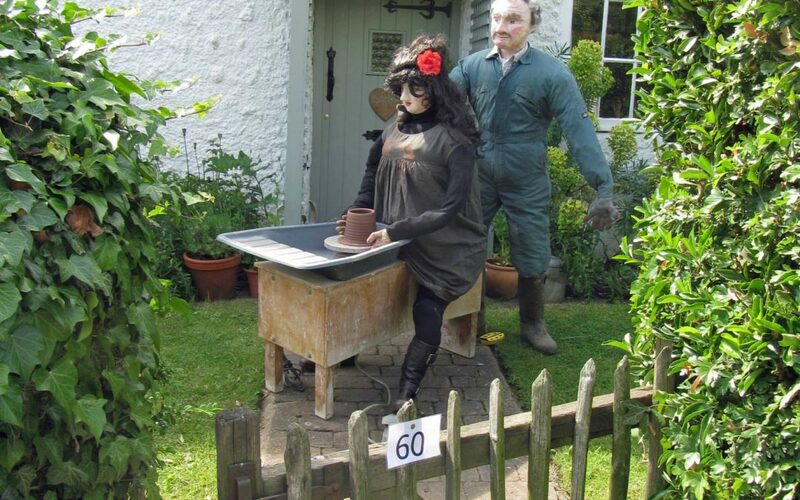 Here’s my entry to the Burton Overy scarecrow festival, after years of people asking me, is being a potter like Ghost! Erm no, but I couldn’t resist this little Homage. The accompanying music on a loop drove some people round the bend but added to the occasion. I raised over £200 for the Death Watch Beetle fund in the studio with a ‘throw a pot’ event, exhausting but worth it to see so many people having a go and the little faces lighting up with hands in mud. Schools don’t often offer this experience any more with health and safety shutting down ceramics departments. I was fortunate in school as a child having this facility in both primary and secondary education. The village made such a fantastic effort and raised enough money to match fund the grant needed to repair the church roof from the Death Watch Beetle. There were other events and substantial contributions from individual donations, we also walked the Leicestershire round in groups, a great day out and fundraising event. The village always put such effort into these events and the organisers did amazingly, giving valuable effort and time to make it a success, the weather this year helped. The next village event is the harvest lunch on 6th October, a team put a tasty two course lunch on in the village hall after the church service, £8 for adults, £5 for children and we take our own drinks. I must remember to buy tickets, it saves me doing lunch for the family and gives everyone chance to catch up.